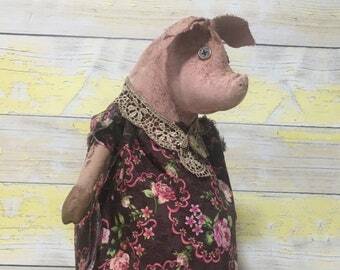 Announcement Ragamuffin Primitives offers quality, original primitive dolls, animals, holiday primitives, ornaments and home décor items, all designed and hand-crafted by me. Nothing is outsourced - all of my creations are made right here in the USA, one at a time. Please visit at Ragamuffin Prims dot com. By now most of you know that my shop name has changed from Cave Creek Primitives to Ragamuffin Prims. It's just semantics - beyond the name change, it's the same me, the same quality primitives, the same quirky original creations - with many more new ones on the drawing board. My work has appeared in four issues of PRIMS Magazine. My designs are intended as primitive art and should not be purchased as toys for children. Thank you again to all of my loyal customers. I do hope my creations will continue to make you smile. 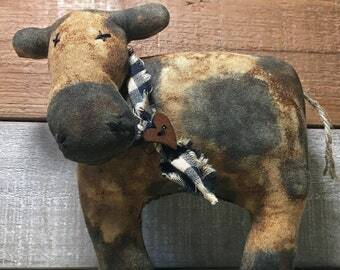 Ragamuffin Primitives offers quality, original primitive dolls, animals, holiday primitives, ornaments and home décor items, all designed and hand-crafted by me. Nothing is outsourced - all of my creations are made right here in the USA, one at a time. Please visit at Ragamuffin Prims dot com. The one in the picture looks exactly like mine! I have ordered quite a few times from Ragamuffuns. I absolutely love all that I have bought. They go great in my country decorated house. Will not hesitate to order again! Completed a few horse ornament orders over the holidays - the result of requests for a non-grungy ornaments. These are sewn from different fabrics, with fiber mane and tail. Great primitive country ornies to display all year long! Primitive Christmas ornaments ON SALE now to Oct.31st. Every ornie 25% off regular price. Order early for Christmas! There’s a new pig in town! Having fun creating some new stump dolls. These are weighted on the bottom so stand easily. It all started with one little brown primitive pig. 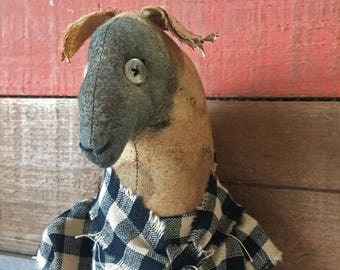 I was making rag dolls and primitive folk art dolls, experimenting with different techniques and designs. Sometime in the spring of 2009, near the Cave Creek boat ramp in KY, I wanted to try something different and created this plain brown pig. Over the next few years, one pig became thousands. The pigs were joined by more primitive dolls, holiday primitives, and other barnyard folk. Plain prim pigs became pig ornaments, pot belly pigs, standing pigs, and sitting pigs. They were featured in magazines. Kentucky gave way to Florida. I retired. Then I didn't. The Cave Creek name changed to Ragamuffin Prims (aka Ragamuffin Primitives). Through it all, it is still just me, doing what I love - creating quirky, quality primitives that make people smile. I'm not certain where my love of primitive things comes from..perhaps growing up in a 150 year old farmhouse. Inspiration comes from many sources, but as you can probably see, I have a thing for animals. My designs usually start with an idea of the finished item in my head - usually at 3 in the morning. Next step is a rough sketch, transfer to fabric, and lots of sewing and tweaking. Sometimes the finished design looks exactly like what I first envisioned. Sometimes it takes several takes to get it right. And sometimes, they continue to evolve each time I make them. 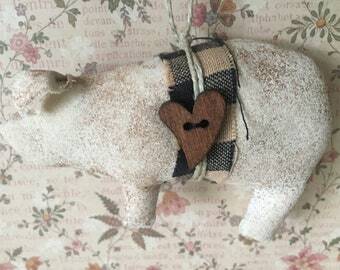 My best sellers are my original primitive pigs. Quality and customer satisfaction are very important to me. I was taught to take pride in my work, and I will fuss for hours over a piece until I'm satisfied. That being said, please remember these creations are primitives. Loose threads, asymmetrical shapes, ragged seams and other quirky traits are intentional and part of the design. 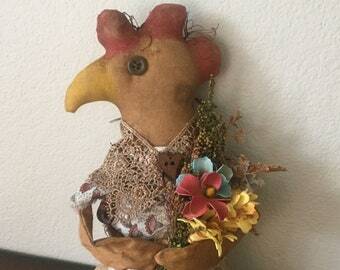 Ragamuffin Prims are intended as primitive art, home décor and collectibles. They are not intended as toys and are not suitable for small children. All of the items you see at Ragamuffin Primitives are my original designs, hand-crafted with love and care, by me alone. Some are simple in design - but still require many steps and hours from concept to sketch to finished product. More complex designs may literally take days to complete the many layers required to achieve their special character. My primitives are artistic creations, and I am very thankful and honored that they have been so well received. I am truly blessed to be able to do what I love, and express my creativity with this medium. With that being said, I try to price items individually and reasonably. You are purchasing a piece of original art that, with proper care, should last indefinitely. Even though I may offer the same dolls and designs - they are all uniquely hand-crafted and all will have subtle differences. All of my creations are works of art, and the larger pieces are signed and dated. I'm so honored to have my work (under CCP label) featured in four different issues of PRIMS Magazine, published by Stampington & Co. Thank you to all of my loyal customers. You continue to amaze me with your enthusiasm for my creations. Thanks for visiting and taking time to read this. I hope my primitives make you smile. I've been creating primitives for years and years. I love quirky animals and strange characters. I hope my primitives make you smile.